Liathach is a mountain in the Torridon Hills. At a height of 3,461 feet (1,055 m), it lies to the north of the A896 road, in the Northwest Highlands of Scotland, and has two peaks of Munro status: Spidean a' Choire Lèith at the east of the main ridge, and Mullach an Rathain at the western end of the mountain. The name Liathach is pronounced [ˈʎiəhəx] in Scottish Gaelic, and means 'The grey one'. When seen from the roadside below, its slopes appear to rise up in a series of near vertical rocky terraces. The mountain is composed of Torridonian sandstone which forms massive near-horizontal strata. They form the numerous terraces that are obvious from afar. The rocks are mainly red and chocolate sandstones, arkoses, flagstones and shales with coarse conglomerates locally at the base. Some of the materials of these rocks were derived from the underlying Lewisian gneiss, upon the uneven surface of which they rest, but the bulk of the material was obtained from rocks that are nowhere now exposed. Upon this ancient denuded land surface the Torridonian strata rest horizontally or with gentle inclination. Some of the peaks, such as Beinn Eighe, are capped with white quartzite, giving them a distinctive appearance when seen from afar. Some of the quartzite contains fossilized worm burrows and is known as pipe rock. It is about 500 million years old. The Torridon landscape is itself highly denuded by glacial and alluvial action, and represents the remnants of an ancient peneplain. The traverse of the hill including both of the above peaks is a challenging expedition; the intervening ridge is for the most part a series of rocky pinnacles known as Am Fasarinen (The Teeth), which reaches a height of 927 metres at the western end and is considered a Munro "top". There are few places on the ridge for descent, so once committed, the walker has little choice but to complete the entire ridge walk. The pinnacles can however be avoided by means of a narrow path that traverses the ridge on the south side. The path is very exposed, and there is much erosion at points where it crosses any of a series of gullies. In winter the traverse of Liathach becomes an even more serious expedition. 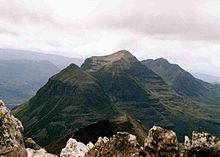 Liathach has four listed "Tops" in the Munro Tables, Meall Dearg at 3133 feet (955 m) stands off the main ridge at the end of the Northern Pinnacles which run north from Mullach an Rathain. The route along the Northern Pinnacles is considered a rock climb, although another route to the top from Coire na Caime only involves a short steep scramble on the final 50m to gain the ridge. Irvine Butterfield considers Meall Dearg "The most difficult top in the British Isles challenged only by the Inaccessible Pinnacle of Sgùrr Dearg". The Northern Pinnacles were first climbed in 1894 by Hinxman, Rennie and Douglas. There are few obvious routes up or down. Routes to each of the two Munro summits exist, following the course of two small burns to give a steep ascent or descent from the ridge. The western end of Liathach, beyond Mullach an Rathain, drops more gently to sea level than any of the burns. Scottish singer Jo Hamilton named a song after Liathach on her debut album Gown. The song was subsequently covered by Prince on his 2013 Live Out Loud tour. ^ "walkhighlands Spidean a'Choire Leith (Liathach)". walkhighlands.co.uk. 2014. Retrieved 9 January 2014. ^ "The Munros and Tops" Page 174 Gives details of Meall Dearg. ^ "The High Mountains of Britain and Ireland" Page 223 Gives quote from Butterfield and route from Coire na Caime. ^ Douglas, W. (1894). "The Northern pinnacles of Leagach". Scottish Mountaineering Club Journal. 3. ^ "'Liathach' - official video". ^ "Live Out Loud tour setlist". This page was last edited on 13 October 2018, at 10:58 (UTC).